Introducing a bold new line of live sound mixers that combine professional features, dramatic styling and astounding value. XL Series� intuitive layout and color-coded control interface is designed to make them easier to use. We�ve added the features you�ve been asking for and then some. And of course the XL3200, XL2400 and XL1600 are built around our proven XENYX high-headroom, low noise mic preamps and warm, musical EQ. Some manufacturers can be sneaky when they tell you how many inputs their mixers have, counting features like CD/TAPE IN as an input. But the XL series really gives you 8 (XL1600), 16 (XL2400) and 24 (XL3200) mono channels and four stereo channels (with two 1/4" inputs apiece�an additional 8 line-level inputs (which can also be used for 4 additional mono mic channels), making it easy to accommodate a wide variety of live performance configurations. 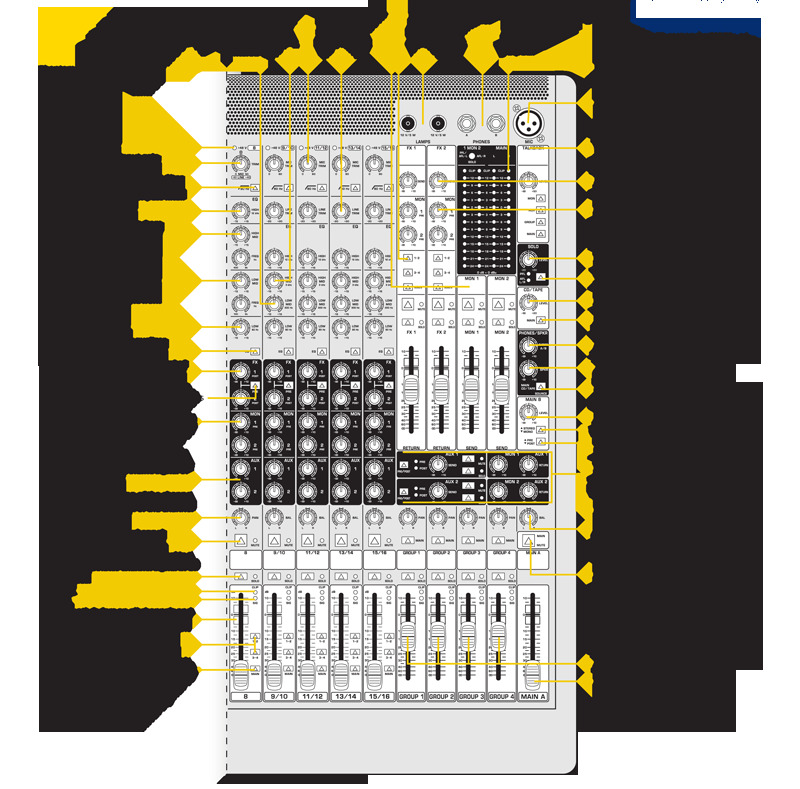 Depending on which XL mixer you choose, that means you can connect up to 8, 16 or 24 microphones (or other mono instruments) and up to four stereo instruments (keyboards, for example). 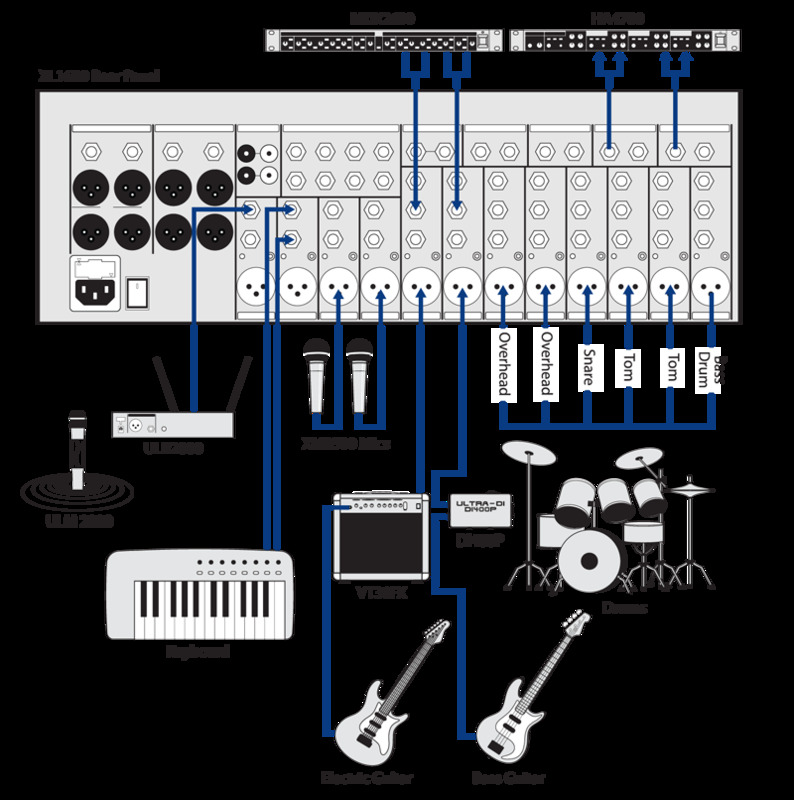 You also get four buses, allowing you to assign multiple channels�say all the mics on a drum kit or all the backup singers� mics�to a single fader. Best of all, you don�t need a black belt in engineering to operate the XL series. 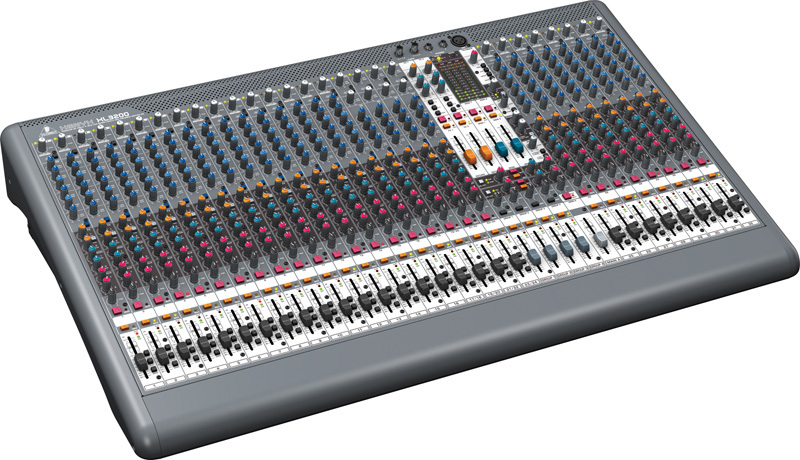 To get started, assign all mics and instruments to their channels by connecting them to the corresponding jacks on the back panel. Now, get ready to quickly become acquainted with the XL series� incredibly user-friendly design.ixer you choose, that means you can connect up to 8, 16 or 24 microphones (or other mono instruments) and up to four stereo instruments (keyboards, for example). You also get four buses, allowing you to assign multiple channels�say all the mics on a drum kit or all the backup singers� mics�to a single fader. At the top of each mono channel strip, you�ll find a TRIM dial (white) for adjusting input gain and an 80 Hz switch that can eliminate unwanted infrasonics such as mic-handling noise. Each mono channel has a 4-band EQ (High, High Mid, Low Mid, Low). High Mid and Low Mid dials (blue) are each paired with a FREQ control (lighter blue) that allows you to select the frequency boosted or cut. Directly below the EQ, there�s an EQ switch allowing you to switch between processed and unprocessed signals. The EQ�s on British consoles from the 60s and 70s are what many engineers believe does their sound the best justice. When it comes to tweaking your sound, they�re kind, gentle and above all, musical. It�s like drinking a fine scotch instead of fortified wine�or maybe receiving a warm hug instead of a kick to the crotch. British EQ�s distinct configuration of wider curves/lower Q and harmonic phase characteristics allows you to add or subtract EQ more generously than you can with conventional EQ circuit designs. When you add low midrange, you get a firmer sound instead of a nasty bonk. When you back high frequencies off a bit, treble backs off just a hair instead of turning muffled. Controls for the channel�s FX (orange), MON (blue) and AUX (red) sends are directly below the EQ section. Use these to assign a channel to an outboard FX processor or monitor and auxiliary channels. Further down the channel strip, the PAN control (black) determines the signal�s position in the stereo mix. The channel fader (black) adjusts the level of the channel signal as part of the main mix. Press the 1-2 or 3-4 switches to assign the channel to a bus. Stereo channels are configured in the same way, but with a fixed-frequency 4-band EQ (blue). 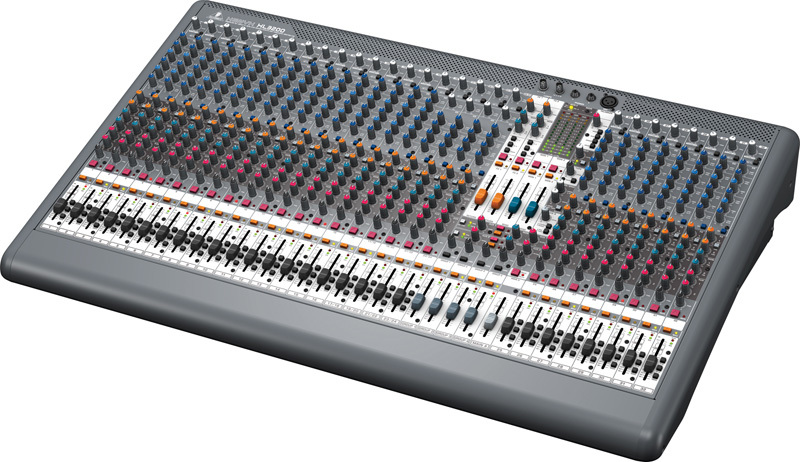 They are equipped with 1/4� stereo inputs, as well as XLR mono inputs, providing 4 additional Mic channels. Once all mics and instruments are connected, it�s time to take a look at the MAIN, subgroup, MONITOR and FX sections. 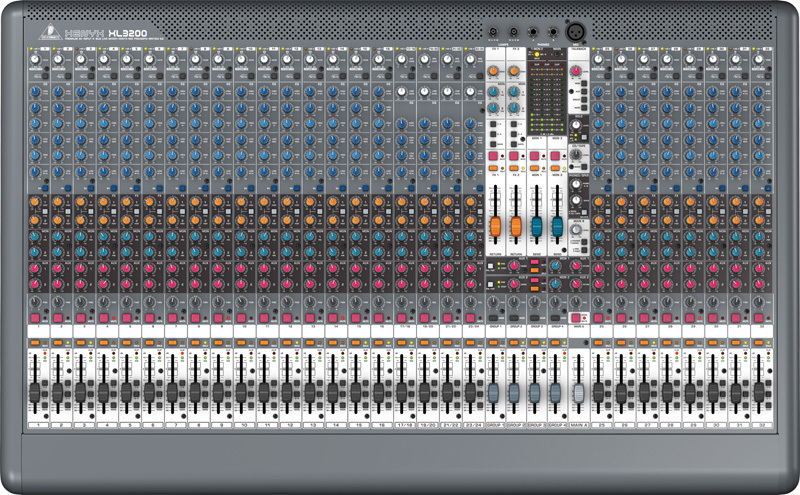 All four subgroups� controls are positioned in the lower right corner of the mixer. They feature individual faders with CLIP LEDs, SOLO switches and PAN controls to adjust the signal�s position in the stereo image. The MAIN A section lies in the bottom right section of the board. It gives you a channel fader (light grey); a 13-LED master level meter in the top right corner gives you a dynamic visual gauge of overall output; a MUTE switch (red) mutes all input channels except CD/TAPE inputs; and a BAL control (black) adjusts the mix of the left and right output signal before they are routed through the MAIN A output. Above, you�ll find the MAIN B section, which governs the signal sent through the MAIN B outputs on the back panel. 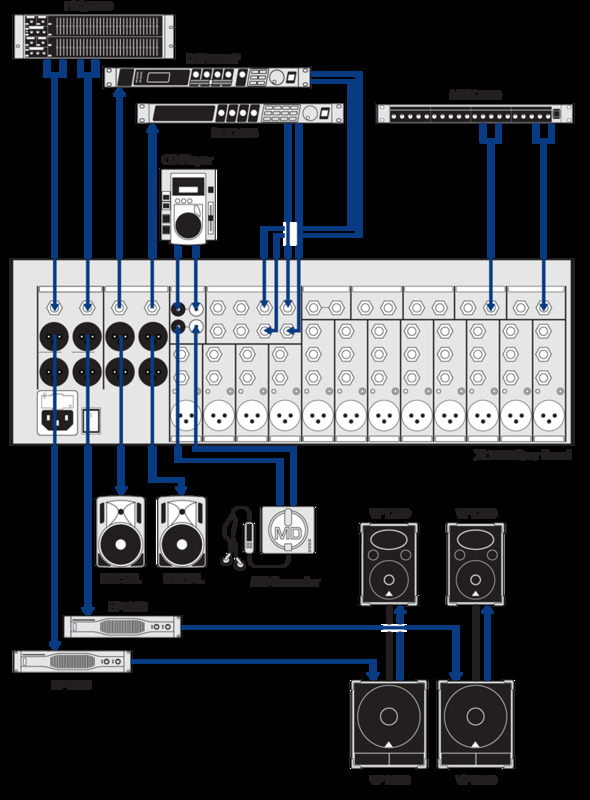 Use the MAIN B section and outputs to connect to a separate power amplifier and multiple loudspeakers, or to a stereo recording system. Talking back, listening up The XL series features a Talkback section in the upper right corner with its own XLR input, LEVEL control (red), and switches that allow you to send its signal to either the MON, AUX, GROUP or MAIN outputs. Finally, a pair of headphone inputs at the top of the board allows you to personally monitor your mix, and a pair of BNC lamp inputs ensures you�ll never have to mix in the dark.